Franchising with The Station Burger Co.
At some point in life you’ll need to thank a first responder. We decided to do it every day. What started as a dream amongst friends in a kitchen became a reality in 2010. The Station Burger Company began with one goal in mind: To serve the highest quality food while honoring the men and women who help keep us safe every day. If you’re searching for a new career opportunity we would love to have you consider joining The Station Burger Co. franchise! Q. How soon can I get my store open? A. From the initial inquiry to opening the store may take six (6) to twelve (12) months, depending on a number of factors, including site availability and condition, plan review, permitting and financing. Q. Does The Station Burger Co. offer a training program and help to open my store? A. Yes, your training will be conducted over a two week period. Fourteen days of training at our headquarters in Paducah, Kentucky and a minimum of six days in your store prior to opening. Each day of training consists of a minimum of eight hours per day. The Station Burger Co. provides learning services delivered face to face to ensure your competency in operating and growing your Station Burger restaurant. Upon your successful completion of the initial training program you will be certified on the Station Burger Brand, store operations and product production. Q. Who decides the pricing I will charge for my Station Burger menu? A. You do, however we will provide you with suggested prices, but your prices should reflect what your local market will bear. Q. What is the typical store size? A. Our typical Station Burger restaurant is between 2000 sq. ft. and 2500 sq. ft. Station Burger restaurants are adaptable to many venues, including, strip and lifestyle centers, urban/downtown locations, conversions of existing restaurants and enclosed mall/food court locations. Q.Does The Station Burger Co. have on-going support? A. Yes, The Station Burger Co. provide a variety of sales and marketing programs including a store grand opening marketing plan, in store promotional signage, marketing and sales collateral. A. Your initial investment may vary depending on a variety of factors, including condition of the building, the amount of improvements performed by the landlord, geographic areas and your own skills. To ensure our franchisees will be able to qualify with both lenders and landlords, we require potential franchisees to have minimum liquid funds available to invest of $75,000 and a minimum net worth of $300,000. Q. Is there a royalty fee? A. Yes, Station Burger’s Royalty Fee is 3% of gross sales, paid monthly. 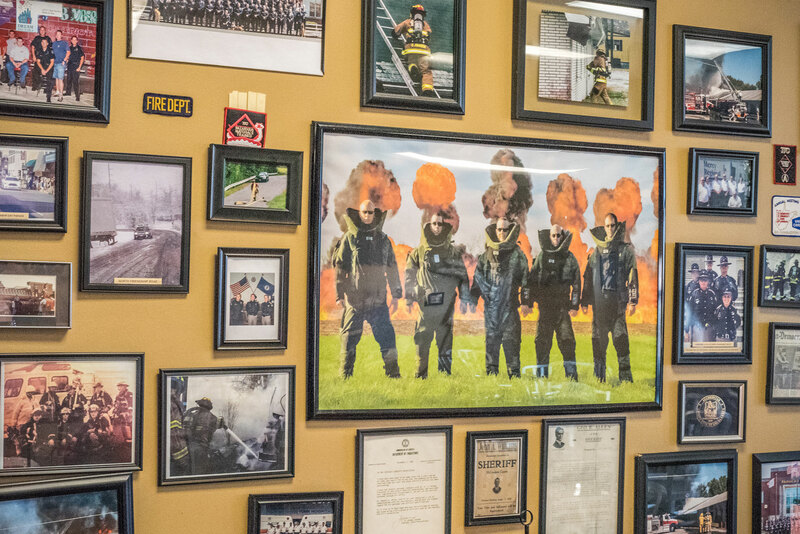 When you walk through our doors you’ll be surrounded by local heroes, past and present – both in the photos on our walls and dining in the restaurant with you. At The Station Burger, you’ll love our freshly made burgers, exceptional customer service and atmosphere.